Back in November I had the opportunity to visit San Antonio, thanks to being a host to ROAM Conference 2014. 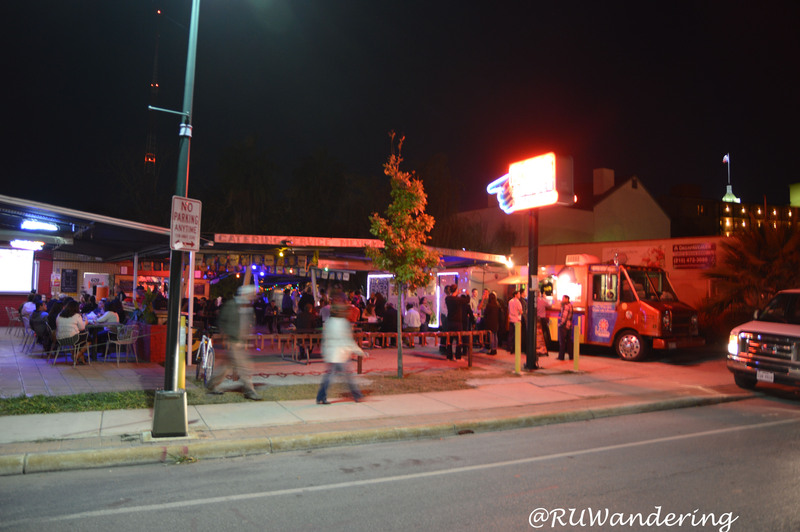 One of the evening activities was a visit to one of the city’s food truck park, Alamo Street Eats Bar. 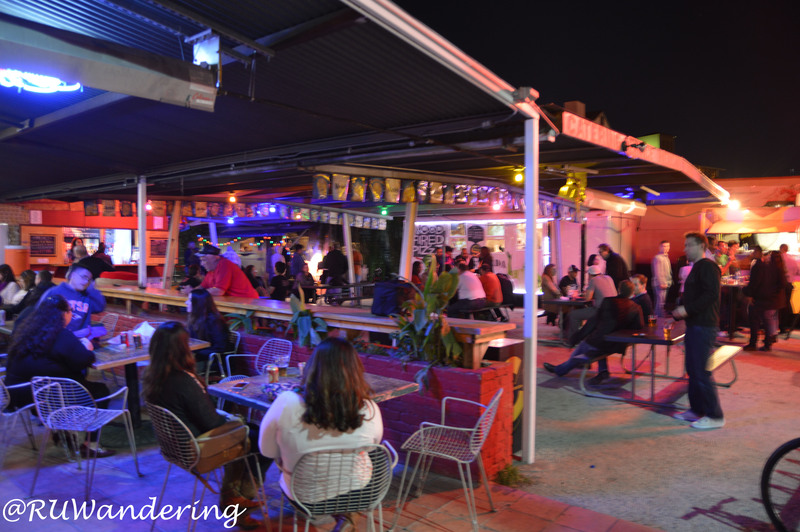 Alamo Street Eats Bar is San Antonio’s First Urban Food Truck Park. Previously, this location was an “ice house” where people around neighborhood to gather and drink. Unfortunately, the Acapulco Drive Inn closed in 2011 after operating for almost 40 years. And as the conference-provided van pulled in, the area sparkled with some nostalgia. Some attendees were already here seated, though locals were here, too, watching college football on a big screen. The bar, which looked similar to a service station food mart served beer (some local) and wine. My eyes and stomach noticed the sample of what San Antonio’s mobile scene offered. The first truck I saw as the black and gold wrap of Where Y’at. While first sight helped me notice Where Y’at, it could be partly my man crush on Drew Brees and Jimmy Graham on a fantasy football team. It also could be partly due to my food crush on the heat and flavor of Cajun and Creole flavors. With San Antonio closer to Louisiana than Raleigh-Durham, I thought I’d get another great chef interpretation of this cuisine. With the idea still in my head of attempting to try all the trucks, I went for a smaller and sharable item, the Pork Boudin Balls. They also had larger portioned items like red beans and rice and various versions of the classic po’boy. 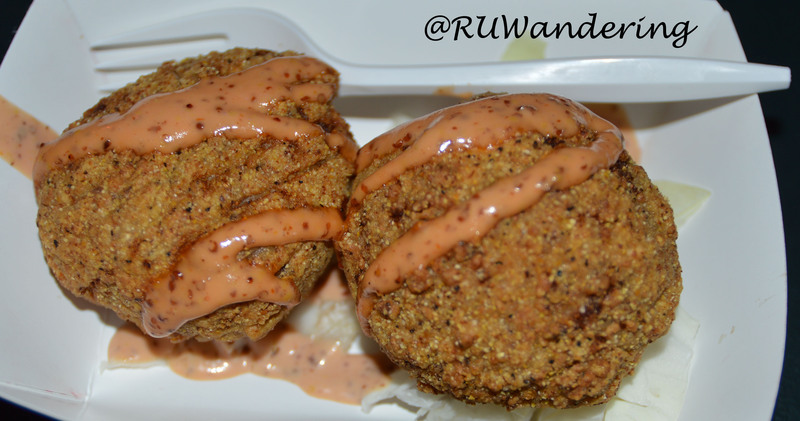 The boudin balls were delicious with the Cajun-spiced heat and I enjoyed the cornmeal-like texture breading. A great start to a food truck adventure. The freshness wheels you in (Wheelie Gourmet). While I was grabbing Cajun and Creole, my wife grabbed a pita from Wheelie Gourmet. Wheelie Gourmet serves up Moroccan cuisine. One thing I enjoy about Moroccan cuisine is the Mediterranean influence. Mediterranean food typically has this fresh flavor to it, which was easy to find in this pita. The pita featured thinly sliced lamb, pickled onions, feta, and pickles. I had to fight my wife’s hands from taking this picture. 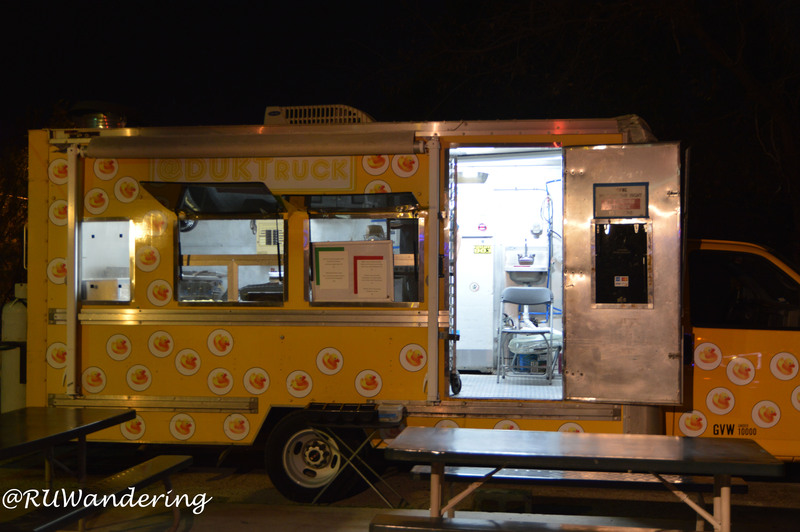 Tucked in the back of the food truck park was the Duk Truck. From the creative genius of Jason Dady, a name among chefs and restaurateurs in San Antonio, this food truck focus on Tijuana-style tacos and the creative deviations of the banh mi sandwich. Tonight, the chicken tacos and raspberry torte dessert caught my eye. 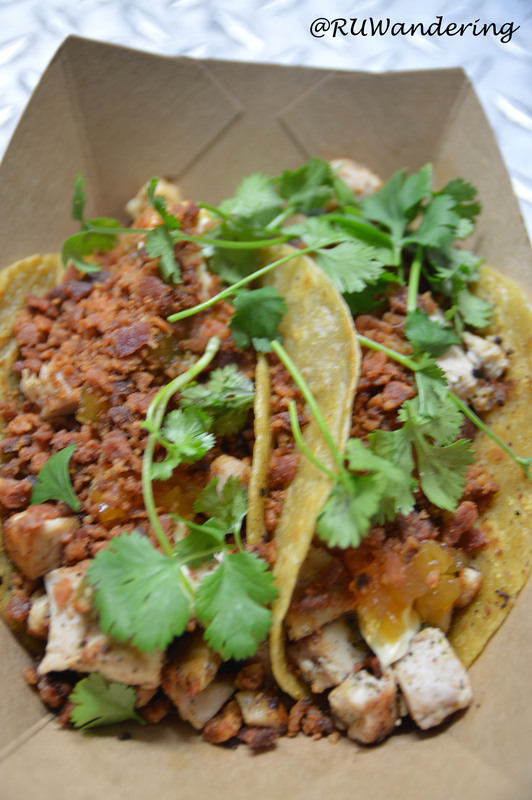 What was not to like about a taco loaded with chicken, bacon, a few sprigs of cilantro, and sweet salsa all on a corn tortilla (my preferred tortilla). 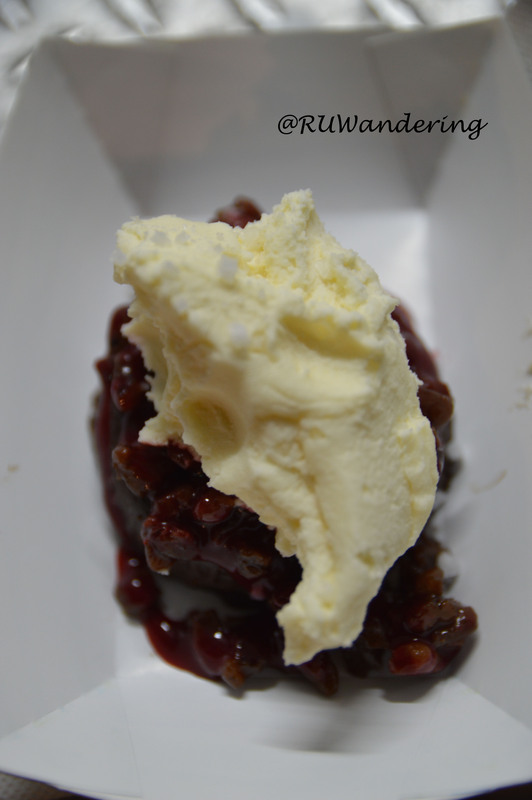 The dessert of a raspberry chocolate torte topped with vanilla ice cream. The moist, but dense, chocolate torte was good enough for my wife to dismiss raspberry and vanilla, two flavors the never-recovering chocoholic dislikes. 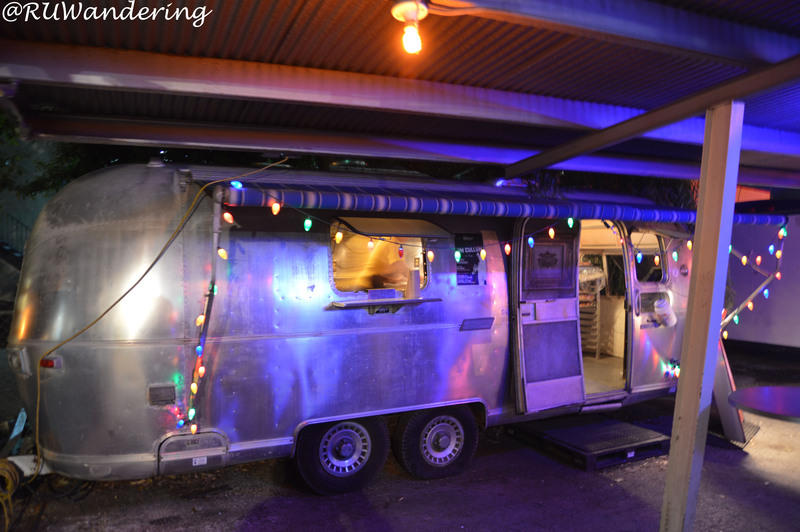 While I sampled a good amount of trucks, I missed out on Attaboy, a burger truck utilizing an Airstream trailer and pizza from Sulla Strada. Based on my observations, these trucks were pretty popular. Attaboy served up burgers and fries (both regular and sweet potato). 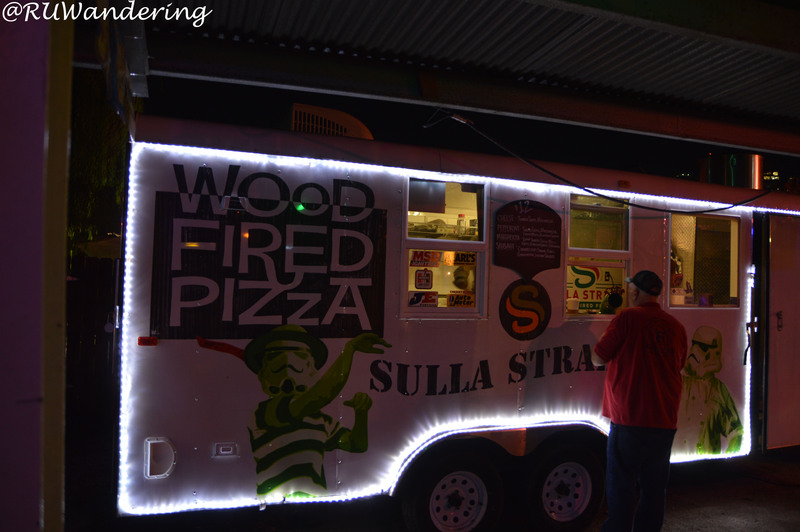 Sulla Strada served up whole pies cooked in a wood fire pizza oven. Excuse me as I wipe the drool off my keyboard… guess it’s time to book another trip to Texas. 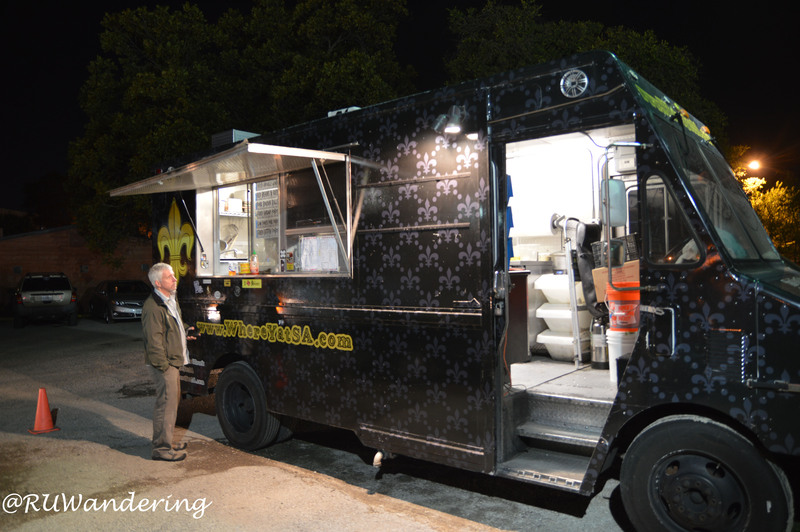 A great resource to San Antonio’s mobile food scene is San Antonio Food Truck Association. You can find them also on Facebook and Twitter. I agree. San Antonio is a fun city. It is a great city. I didn’t realize how cool it was until the cab pulled into downtown. I walked most places, they have a Bikeshare, and some nice hotels. 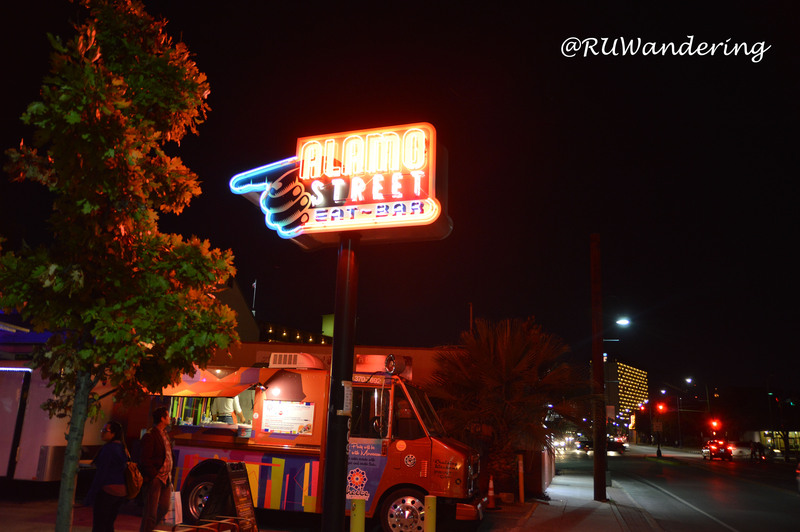 That photo was actually taken as I waited for the van to come out to Alamo Street Eats Bar.